To make the very best coffee, you need to invest in the very best equipment – and this means more than just the brewer itself. One of the most important items is a top-quality grinder, so here is our Baratza Forte AP coffee grinder review in detail. For many people, this might seem like an incredibly expensive item just to grind coffee – so let’s briefly remind ourselves why high-quality grinders are necessary to obtain the best possible cup. When brewing coffee, the key is controlling the extraction. If coffee is over-extracted, it ends up tasting bitter, and you will probably need to add sugar or milk to make it more palatable. On the other hand, if coffee is under-extracted, it will be flavorless and insipid – and unpleasant to drink. One of the main ways to control extraction is through grind – you need to choose exactly the right grind for the brewing method you are using to ensure the coffee is in contact with the water for exactly the right amount of time and that the extraction is uniform and even. When coffee is ground uniformly, extraction is perfectly even since the grains are all exactly the same size. However, if the coffee is not ground evenly and you have some grains that are much larger than others, the smaller grains will be over-extracted, but the larger grains will be under-extracted. This will seriously impair the flavor of your coffee. With cheaper blade grinders, this level of grinding perfection is not possible. The blades slice the coffee beans and you end up with coffee that is chopped up into all kinds of different sizes. However, with a burr grinder, the grind can be controlled much more precisely, hugely improving the quality of your coffee. When stepping up to a model like the Baratza Forte AP, you are giving yourself professional-grade precision over the grinding process. With 230 different grind settings, you can experiment with different coffee beans to find the perfect combination of grind and extraction time for your brewing method. Furthermore, this grinder performs well for the full range of grinds – so you can grind for any type of coffee, from very fine for espresso right up to coarse for French press. 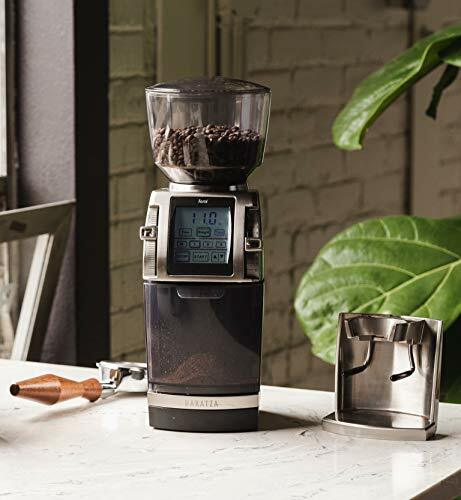 When you hit upon the ideal grind, with this grinder, it is then easy to repeat exactly the same grind using the easy-to-adjust controls, giving you great-tasting coffee every time. We also particularly like the three pre-set one-touch grinds that allow you to repeat your most commonly used grinds with the minimum of effort. 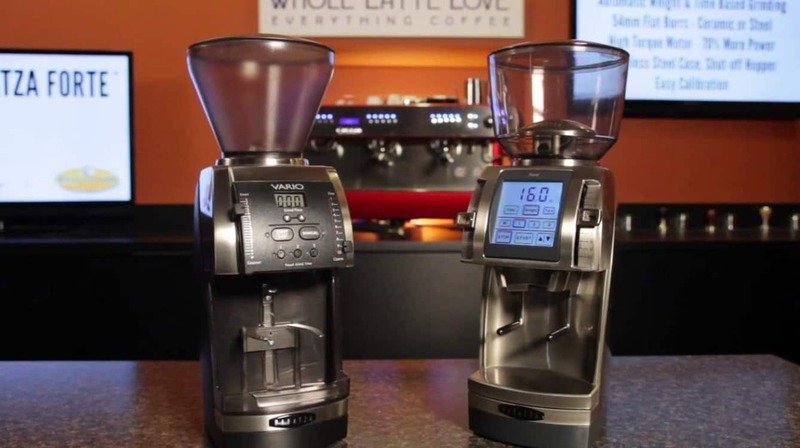 The fact that this grinder also offers weight- and time-based dosing also allows you to control your brewing parameters with the utmost accuracy. In fact, you can dose to an accuracy of as little as 0.5g, taking all of the guesswork out of dosing your coffee. Another important feature is the flat ceramic burr grinders themselves. They are carefully manufactured to ensure they stay sharp and continue to function exactly as you require them to. The high-torque motor gives the blades up to 70% more power, making the grinding process extremely fast and efficient. 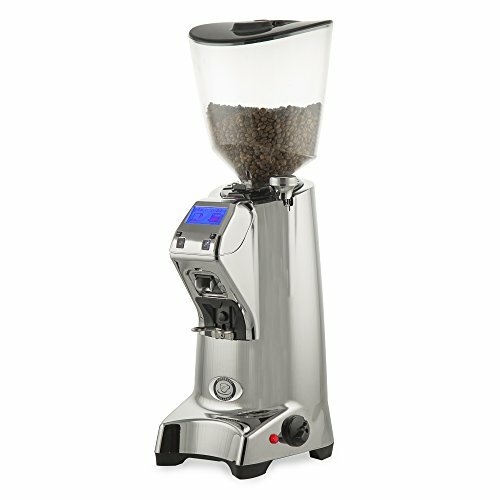 Although very expensive for a coffee grinder, this machine is an extremely popular option. When it was first launched, it claimed the Specialty Coffee Association of America’s prize for best product – and despite the high price, we still consider it to be good value for the money. 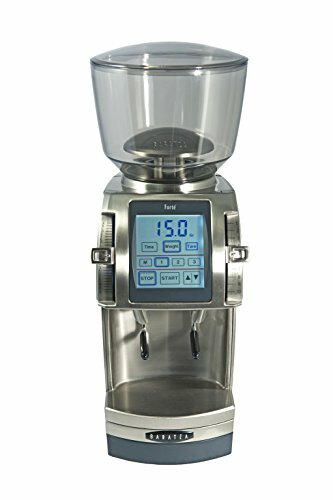 This commercial-standard burr grinder measures 7.2” x 5.2” x 14” and weighs13lbs. It features 54mm professional-grade ceramic flat burrs that are engineered to maintain high throughput and retain sharpness. 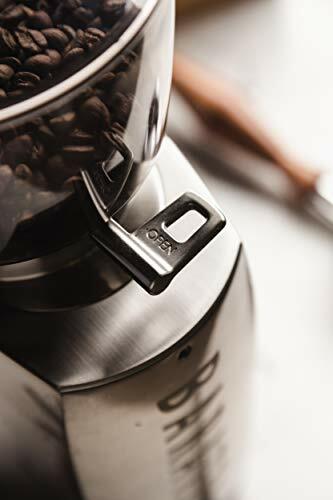 It has 230 different grid settings, allowing you to fine-tune your coffee grinding with great precision. It features a clear digital LCD display with programmable buttons – it also has three pre-set options for one-touch, repeatable grinding, allowing you to quickly grind your coffee the way you like it. It includes weight and time-based dosing, allowing you to control and monitor how much coffee you are using for each brew. If you are using a piece of equipment that is as high-quality as this grinder, you should learn how to use it properly. If you are a coffee novice, you are probably not looking in this price range for a grinder in the first place, but you should make sure you understand the theory of grinding coffee. For example, if you want to make espresso, you need to grind the coffee very fine. This is because when brewing using the espresso method, the coffee is only in contact with the water for a very short time, so it needs to extract quickly. For methods like the French press, however, you need to use a much coarser grind since the coffee steeps in the water for a much longer period and you don’t want it to over-extract. Once you have mastered these basics, you can use a machine like this Baratza grinder to fine-tune your grinding skills and expertise to produce the best tasting coffee possible. If you are looking for a real top-of-the-range burr grinder and money is no object, this model from Eureka is definitely worthy of your consideration. It features volumetric programming that allows you to dial in the perfect single or double dose. It also has slide-open hopper door, making it easy to open to pour in more beans as and when they are needed. One major difference between this model and the Baratza is that it features stepless grind settings instead of fixed values. 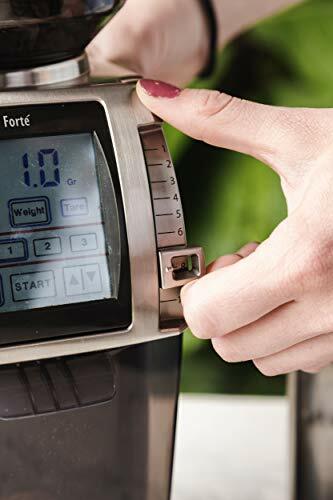 This means you have the possibility of infinite grind settings, allowing you to fine-tune the coarseness of your coffee to find the perfect grind for your brew. It includes 75mm flat burrs – they are made of stainless steel rather than ceramic, as in the Baratza. Finally, this machine is fast and will grind up your beans ready for use in no time at all. This is a professional-grade high-quality grinder that is suitable for coffee shop use or home use. It is an expensive piece of equipment, but if you are looking for an effective and highly efficient coffee grinder that offers the ultimate in precision grinding, this could be another excellent choice. On the other hand, some people may actually prefer the fact that the Baratza model has numbered grind settings, allowing you to record the grind level more easily to track the levels that gave you the best results. The Baratza, although expensive, is also still considerably cheaper than this model. If you value great-tasting coffee and care enough about the flavor of your brew but still don’t want to go as far as paying for a high-end professional-grade grinder, this model from La Pavoni might be the ideal compromise between quality and price. While this grinder doesn’t have the 230 grind settings of the Baratza and doesn’t have the unlimited settings of the Eureka, it still has nine distinct settings from very fine to coarse – which should also be fine for most coffee lovers. This grinder has a very distinctive look, and one of its big selling points is the fact that you can grind into the dedicated container or you can remove the container and grind coffee directly into the basket, giving you an extra layer of versatility. This grinder also boasts extra features including an auto-shut off option which can help you save power consumption and reduce your electricity bill. This machine is made in Italy – and as everybody knows, the Italians are among the finest in the world when it comes to crafting, designing and building high-quality coffee-making equipment. If you are looking to step up the quality of the coffee you are making at home, you might not need to think about your coffee maker – you might actually need to think first about your grinder. If that’s the case, a Baratza might be what you’re looking for – so our Baratza Forte AP Review should help.